Hydrex frequently performs large, complex projects across the globe, but the company says its smaller projects are equally essential. Daily, its divers conduct smaller maintenance operations including installation or replacement of anodes, blankings, replacement of transducers, propeller cleanings and all types of inspections. Building upon conventional technical skills and know-how while also taking advantage of the latest technology, Hydrex offers a unique hull monitoring service. This gives shipowners total control of their ship's hull condition and consequently its performance, with only a minimum of work on their part. Underwater inspections represent a small investment and, if properly done, have the potential to save an owner a great deal of money. Regular inspections carried out by competent divers and followed by comprehensive and accurate reports can detect problems so that they can be corrected early. This prevents the costlier repair which neglect and further damage would make necessary. Because Hydrex has more than 40 year of experience in both maintenance and repair services, the company can carry out any required follow up repair very fast without any unnecessary loss of time. Planning in a new date is not needed as all Hydrex diver/technicians are skilled to perform the repair work as well. If the damage found during an inspection can be anticipated, the required equipment can be mobilized in advance. Otherwise it can be transported to the location of the vessel immediately from one of the Hydrex fast response centers where a large stock is available for the teams at all times. This was demonstrated when a rope guard had come loose, which was revealed during an underwater inspection. The team secured the rope guard without any delay for the owner. When on an oceanographic research vessel needed 52 sacrificial anodes installed, Hydrex sent a diving team to Dunkirk to perform the underwater installation. The customer had passed on all the necessary information to the technical department and after preparations in the Hydrex fast response center the equipment was loaded onto one of their trucks and transported to the vessel’s location. In this case the anodes were supplied by Hydrex, saving the owner the trouble of having to arrange the delivery himself. 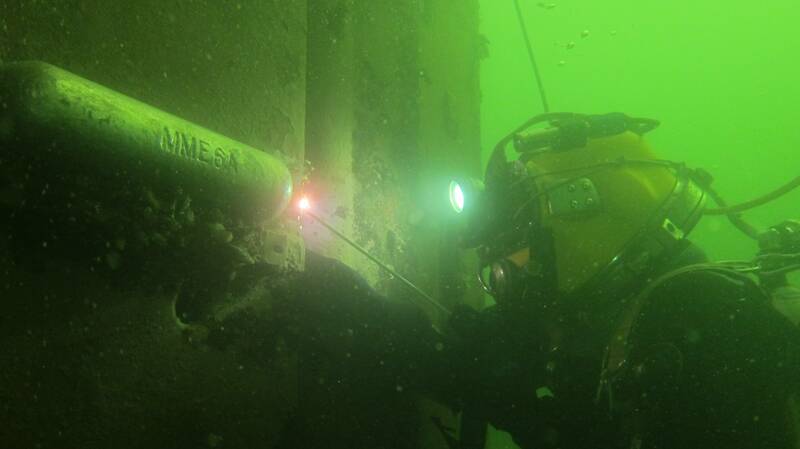 The anodes were then installed by the diver/technician team, giving the vessel protection against corrosion. A team of Hydrex diver/welders blanked all underwater openings of four offshore vessel to keep them safe during a cold stacking period. This was done in Dunkirk, France, over a period of four weeks. Two hydrographic survey vessels, an oceanographic vessel and an offshore installation vessel were layed up in Dunkirk for a long period. It was essential that they were kept safe during this period. Especially the underwater part of the ships needed additional protection against the constant exposure to salty seawater. For this reason Hydrex was asked to develop a fast and complete solution to close off all the underwater openings of the vessels including sea chests, overboard valves and box coolers. Between 30 and 40 blanks were installed on each ship, ranging from small 10 x 10 cm plates up to very large 4 x 4 meter ones. Hydrex teams can very quickly replace any type of transducer without any hindrance to a ship’s schedule. The company can however also install them should this be required. 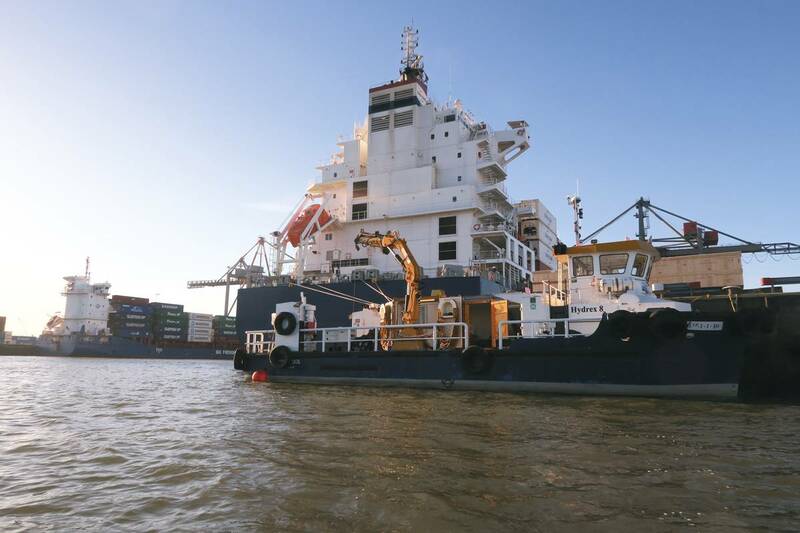 This was the case when two 193-meter general cargo vessels needed a speed log installed during their stay in Antwerp. A Hydrex diving team started the operation with an inspection to determine the best place to install the speed log. They then marked the exact position where the speed log was to be positioned. The next step was to install a mobdock over this area creating a dry space within it. Part of the team cut a hole on the inside of the hull to the exact dimensions of the speed log. They then fitted and installed the housing. An oil ring seal was used to closed off the housing from water ingress. Simultaneously the rest of the team prepared the wiring for the speed log which was connected to the housing. At this point the mobdock was removed. The wiring was then installed inside the vessel and the speed log was connected to the ship’s electrical system. The installation was done flawlessly and afterwards both vessels had a fully operational speed log system on board. Hydrex has developed a new method of propeller cleaning. The traditional approach in the industry is to let the propeller foul and build up a calcareous growth and polish once or twice a year underwater or in drydock. This polishing is done with a grinding disk and can be quite damaging to the propeller because a substantial amount of metal is removed. This can alter the shape and efficiency, cause roughness and increase rather than reduce friction. It is also a major source of marine pollution which is a problem in many ports. Hydrex discovered that more frequent, lighter maintenance of the propeller is the optimum approach to propeller cleaning. This is done using a different tool to a grinding disk to catch the propeller before a calcareous layer builds up. If done right and done regularly this can result in 5 percent or even more fuel savings. These savings far outweigh the cost of the propeller cleaning itself. Because the propeller is treated regularly, the cleaning is light and quick. No material is ground away which is good for the propeller and the environment. The propeller is kept in an ultra-smooth condition and this is where the fuel savings are achieved. Hydrex teams consist of highly trained and experienced divers who can spot problems that are not directly related to the operation at hand. If they do this will be communicated this with the customer. Hydrex can immediately follow up on this if needed. Small operation like the ones described in this article can be combined with one or more other operations very easily. This can be another maintenance operation or any type of repair job. By doing this, the shipowner is saved the hassle and cost of multiple mobilizations and possible delays to his vessel’s sailing schedule.